R-L: The Advisor to the Chancellor and Director of Africa Initiative, Washington University in St. Louis, Benjamin Ola Akande; Chancellor, Washington University in St. Louis, Mark S. Wrighton; and IITA Director General, Dr Nteranya Sanginga during IITA DG’s visit to the University. 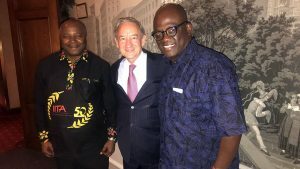 The International Institute of Tropical Agriculture (IITA) and the Washington University in St. Louis (WUSTL) are exploring areas of collaboration that would address poverty, hunger, and youth unemployment in Africa. The plan is to leverage on the strengths and expertise of the two institutions to solve vexing constraints to Africa’s development. The resolve for a joint approach was made during a visit by Dr Nteranya Sanginga, IITA Director General, to WUSTL where he met the management of the University in the US. During the visit, Dr Sanginga held strategic meetings and discussions with Daniel Bentle, Director of the Center of Experiential Learning of Olin Business School; James Wertsch, Director of the McDonnell International Scholars Academy; Kurt Dirks, Vice Chancellor for International Affairs; Himadri Pakrasi, from Plant Science; Benjamin Ola Akande, Advisor to the Chancellor and Director of Africa Initiative; and the Chancellor, Mark S. Wrighton. Located in St. Louis, WUSTL prides itself among the world’s leaders in teaching, research, patient care, and service to society. The university is committed to learning and exploration, to discovery and impact. IITA, on the other hand, is headquartered in Nigeria with hubs in East, West, Central, and Southern Africa. A member of the CGIAR, IITA is the biggest international agriculture research center in Africa that is committed to agricultural transformation and a food secure Africa by leveraging on the power of science and technology. The center gained global reputation for its breakthrough in the biological control of cassava mealybug, biological control of aflatoxins, and the development of improved varieties of banana/plantain, cassava, cowpea, maize, soybean, and yam. IITA’s new research initiatives include addressing youth unemployment using the power of science. Besides the broader context of poverty, hunger, and unemployment, the two institutions will be focusing on some specific areas such as the engagement of youth in agribusiness, linking food nutrition and public health, and taking advantage of WUSTL’s current work on health issues and strength in medicine activities across the continent. The two institutions will also delve into areas such as understanding the nexus between Food, Energy, and Water. There is a proposed focus on nitrogen fixation in cereals and cyanobacteria, and the linkage between the science of discovery and application. The IITA and WUSTL collaboration fits into IITA’s refreshed strategy of lifting 11 million people out of poverty and reclaiming 7.5 hectares of degraded land. But more importantly, it aligns with the United States’ commitment to reducing poverty and helping people to progress.